Today is my brother’s birthday – the day when he becomes Sten “vintage vehicle” Soomlais. Exactly one year ago, my family gave him a gift card for my bag making services as a present so he could have a say in designing his very own bag. Sten was a typical Tartu hippie during his teens but as times are changing, the former urchin is now becoming a family man which means that the flower child satchels have to be replaced by a more respectable bag! His everyday life consists of lecturing and working in an office combined with toiling away in the garage with a few business trips here and there. In his spare time, Sten needs a receptacle for his dancing shoes and holiday gear for a relaxing time under the warm sun. In the near future, he will also require space for spare diapers and a heap of toys. 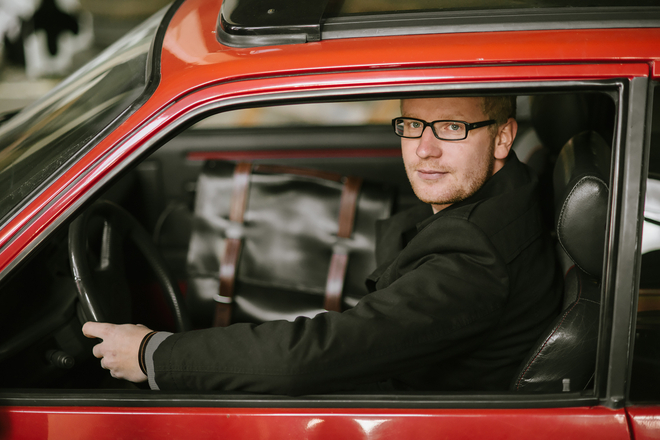 In order to cater for all these diverse demands, this soft bag which looks like a briefcase was chosen because it is clean-cut and respectable enough for work but not too formal to feel out of place in Sten’s undoubtedly favourite toy – his small vintage car Peugeot 205 GTI. As long as I can remember, my brother has always been drawing cars, fixing them up and driving around with them accompanied by writing and passionately talking about his most beloved means of transportation. For this reason, we knew straight away that the photo shoot with Sten and his bag had to take place in the garage where he works on the cars with the same kind of burning passion that I put into my design work. We have always had a silent agreement that I will take care of his leather accessories for as long as I live and he makes sure that my motor vehicles stay safely on the road. Driving alone with the volume turned up is one of my favourite parts of the day as it helps me charge my batteries and organise my thoughts to be ready to tackle whatever obstacles that come my way. Thus, in addition to brotherly love, Sten’s professional skills also play a very important role in my life! Sten is exactly like an older brother should be – a wise and influential role model who is always (sometimes even too) protective and has lived in this world longer than me for exactly the right amount of time to be able and allowed to teach me. He has tried to scare away potential boyfriend candidates and preached me in alarming situations where no one else dared to. In addition to that, he has the world’s greatest laugh, his humour has salvaged a number of sticky situations and I do not know anyone who could write cooler (birthday) invitations! It is a shame, however, that he does not let his blonde locks live up to their full potential because these remnants of the hippie era could be the perfect way to pay homage to those carefree times! And once again, thanks for the stylish photo shoot goes out to the photographer Tõnu Tunnel!